Created 16 June 2003, links updated monthly with the help of LinkAlarm. Distance Opportunities for Interpreter Training Center. BA in ASL-English Interpretation. Recognizing the right of deaf and hard of hearing individuals to equal communication access, the Distance Opportunities for Interpreter Training Center designs and delivers quality education for and about Sign Language Interpreters. Established in 1993, the UNC-Distance Opportunities for Interpreter Training (DO IT) Center provides an array of educational offerings and collaborative partnership opportunities related to the field of American Sign Language - English interpreting. John A . Logan College - On-Line courses. Johnson County Community College - Educational Interpreting Certificate Program. Spartanburg Technical College. 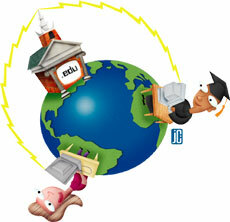 Click on "Distance Learning". Associate Degree program. Arter, J. A. et al. Portfolios for assessment and instruction. Australian Flexible Learning Framework. Effective online facilitation. Barker, L. & Edgar, L. Online learning - a learner centred perspective. Berge, Z. L. The role of the online instructor/facilitator. Catalyst. Choose technologies for your distance learning course. Which technology will be most effective for providing course content, activities, and interactions will depend on your learning objectives for the class, as well as upon the media available. Choosing a technology for your distance learning class will be easier if you have clearly defined your learning objectives and have some knowledge of the resources available to you and your students. Chicago Public Schools. How to create a rubric from scratch. Choy, S., McNickle, C., & Clayton, B. Learner expectations and experiences: An examination of students views of support in online learning. A downloadable .pdf file. Crafting questions for on-line discussions. This seminar will acquaint you with strategies, ideas, and examples to help you craft on-line discussion questions. Investigate how to use these questions to achieve specific learning outcomes, guide the discussion process, and provide meaningful feedback to your students. Florida Gulf Coast University. Principles of online design. Kruse, K. Gagne's nine events of instruction: An introduction. Manto, M. & Bateman C. Building a learning community. NCREL: Technology in education. Assessment and evaluation, e-Learning, planning, policy, professional development, research, and teacher preparation. Oliver, R., Herrington, J., & Omari, A. Creating effective instructional materials for the World Wide Web. Rubrics for Web lessons. The rubric is one authentic assessment tool which is designed to simulate real life activity where students ar   e solving real-life problems. As students become familiar with rubrics, they can assist in the rubric design process. This involvement empowers the students and as a result, their learning becomes more focused and self-directed. Soloman, B. A. & Felder, R. M. Learning style questionairre. A teacher's guide to distance learning. TeacherVision.com. Analytic vs. holistic rubrics. Toucanhouse. What makes for good online learning? Wiggins, G. (1990). The case for authentic assessment. Program Description and Objectives: Northeastern University and Project TIEM.Online are excited to announce a Master's Degree Program for interpreting educators, beginning in September 2005. Pending approval from the university, this program will begin accepting applications for this exciting new degree program in the spring of 2005. The program will offer a full degree program, with most courses being offered online via the WWW. 1. This image from http://foyt.msd.earthlink.net:81/blink/aug00/netnumbers.html (bLink magazine) which is no longer extant.